Wow...such a nice wallpaper of Yondaime. The scan is very nice, and clean. The bg work is nice too. I really like the colors and effects you used. Nice work. wow thats really hot, love the background and the scan, they both fit perfectly well together! Wah! 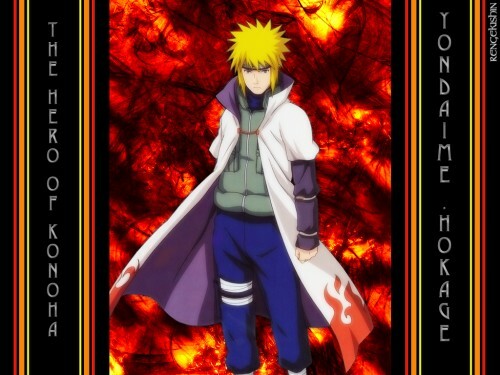 Yondaime , looks fiery ,thats why it's sooooo cool.This is good work .So, keep on workin man! Hey! where's Ang's Comment ? yay! Yondaime ... great wallpaper. I like it a lot. Good job and thanks for sharing! woot! This is one of the nicest wall of Yondaime I've see and I already have about 5. The red, orange, yellow strips at the side complement the background behind Yondaime. I'm glad Yondaime stands prominently out, although the purple colour looks kinda weird on him, would have thought it would be a bright blue or green. Yondaime is just the coolest ninja ever. I really like his white cape or what ever that is. I really like the background in this wallpaper-very nice.